My chap took a mates’ holiday recently, so I had some time all to myself on hand. You might think I’d have planned a raucous ladies’ night out, spa day, or my own trip as an indulgent use of my “me” time. Instead, I finally decided that Raleigh was due for a clear “best in show” of its many downtown cupcake shops. That’s right. My boyfriend went out of town, so I did what any gal with a little freedom would and covered our coffee table with cupcakes. (I might mention, over a week later that my scale is still pissed about the endeavour. Merde). There are three shops within a mile of home. I poured over Yelp and Google reviews to determine who might place first in heat and what I should order in each shop. The reviews were literally the same for each shop, that is – very hit or miss. The common complaint being dryness and cost. The common accolade being not much more than “my favourite indulgence in downtown Raleigh.” There didn’t seem to be one or two items that were consistently ordered, a “must have,” if you will. I would have to get my hands dirty and go in rogue. – apparently a national chain, I’m sad to say. It’s close to my house so I included it anyway. Literally, the shop had two small cases of cupcakes and a cooler of drinks. It was a fairly sterile and fairly large retail space. I have no idea how it stayed open for business. – a local chain of a few shops. The decor is girly, decorated in pastels with replicas of wedding cake designs throughout. There is a large case of cupcakes and another of gelato. The menu also features coffee and wine for a one-stop-ladies-who-lunch-stop. The weird thing about Sugarland was that on their website and in shop, they clearly advertise the products as frozen. Leave them out for 10 minutes a shop sign says. Apparently at one time fresh (how long ago?? ), but now not very appealing. – this intimate little shop has purportedly been in business for ages. The quaint size is decorated in pink and brown and old timey looking banners. It was like a little kid’s birthday party in a field…in the ’20s or a really cheesy bridal shower. If I had to envision a cupcake shop, it would look most like this. There was a giant cupcake case, a few tables, a coffee-centric menu. We won’t address price, as all cakes were in the $3.25-$3.50 range. A moot point with such a small variance. Let’s start with the packaging presentation. Gigi’s was the clear winner with a mint green box. It looked like a gift you’d most like to bring a friend on their birthday. The inside of the box was fitted with a little cupcake bed AND had the perfect sized indentation for your thumb to sneak under the cake and lift it out to plate. Brilliant design, I suppose to be expected for a national chain. While Sugarland had a rather cute store, the packaging was something to be desired- a plastic box, like the kind you see for a to-go salad at a grocery store. Not charming. 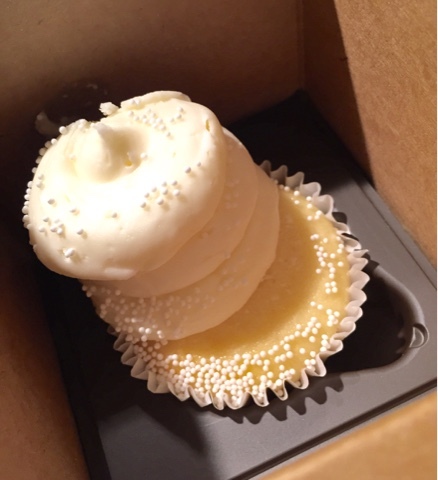 Sugarland’s cupcakes had the most icing and decor on top, so it made zero sense to squash them into plastic where the icing would stick to the lid. The dumbest design award goes to The Cupcake Shoppe, a bag. A bag! The cakes had way too much freedom to roam and of course toppled over in transit. Cute sticker, dumb idea. For some reason, when I think cake, I think box. Gigi’s for the win…by a thumb hole! The inside of Gigi’s box, what a great idea! 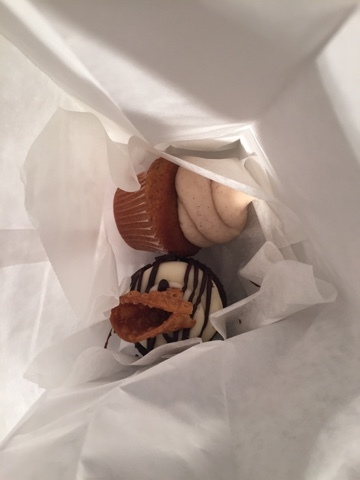 A peek into The Cupcake Shoppe bag. Note, the cupcake sleeping on its side. Who thought of this?? This is literally the only product that you sell!! So let’s talk flavour. I decided I’d just buy anything that sounded particularly delicious, not limiting the number per shop. Disclaimer: chocolate cake and chocolate icing are not my favourites, so that ruled out quite a few. 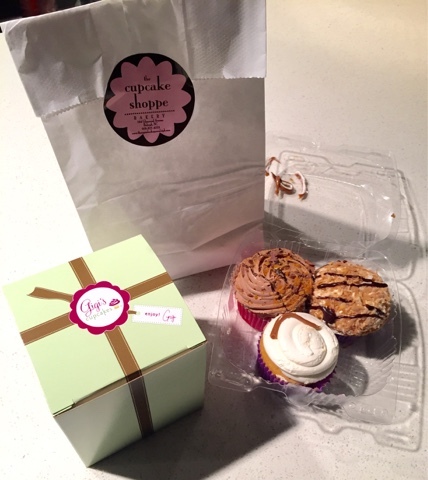 Gigi’s – I tried a wedding cake flavored cupcake. I LOVE wedding cake, slightly almondy, fluffy perfection. Can more of my friends get married so that I can have some please? 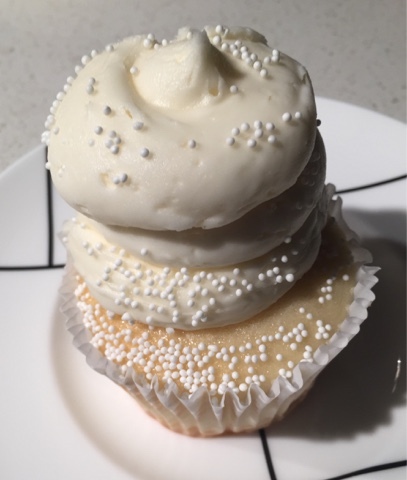 Unfortunately, this sucker was white cake with a vanilla butter cream icing glob. Simple yes, but definitely not wedding cake. This cupcake also had a gangster lean when I bought it, the icing nearly falling off the side. And how about those sad looking sprinkles? These were some decent looking cakes. Too bad the icing stuck a bit to the lid of the stupid, plastic box. 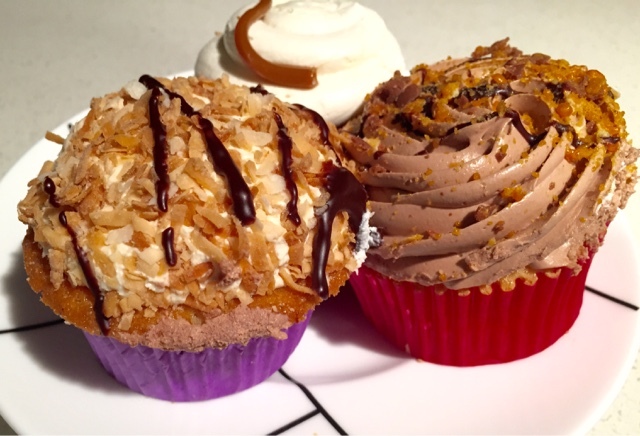 The flavors here appealed to me much more so I needed to taste three flavors: dulce de leche, Samoa, and Butterfinger mousse. Frozen or not, these were generally “okay,” not worth the calories. I really thought Butterfinger would be the hands down, take-all winner, but the icing was a bit oily and bland. Surprisingly, the Samoa one killed it. Okay, maybe not surprisingly, as it was the only cupcake of the bunch that had filling. Who doesn’t love bonus icing?? And the coconut flavor was natural. Meow. The Cupcake Shoppe- A cinnamon cupcake with cinnamon frosting was an easy second place of all cupcakes. The flavor was great and so savory it could almost be breakfast. However, she lost points for falling over in the bag and having no filling. Actually, NONE of the cupcakes in the shop had filling which I found sad and lackluster. Muffins wearing icing aren’t cupcakes, people. They require pizazz! (Jazz hands). A cute cashier saw the disappointment in my eyes regarding the lack of fillings and offered that the cannoli cupcake icing sunk far low into the baked good, so it was basically a filling. I eyed the baked good suspiciously and took it home with me even though it was chocolate. I ate the cupcakes over the course of three days, most of their generous icing scraped to the side, which is saying something because I LOVE icing. Of course I took a cake slice shaped sliver out of each of them on night one for my experiment. (This gave me flashbacks to when I used to do this to my brother’s muffin’s as a kid. He would eat four and I would take one tiny sliver and it would piss him off exponentially, so it quickly became a habit that stayed until I moved out of the house). Honestly, I wouldn’t return to any of the cupcake shops. I love to bake and it would be easier and less expensive to make something for a special occasion at home. I most admit that this grueling process was terribly fun and finally delivered some honest results to the confectionarily confused city of Raleigh. 1. Gigi’s – thumb hole! In conclusion, spend $2.37 and make your own damn cupcakes. I honestly am not sure how the city supports three cupcake shops in one neighborhood, but that I can’t buy tall pants at Banana Republic. 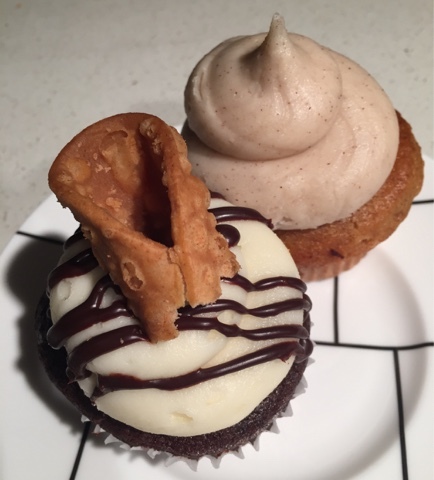 If you HAD to pick up some cakes, stop at Sugarland, they look good, even if they aren’t all amazing flavors, you might come out with a winner. And bring your own box. Better yet, borrow inserts from Gigi’s. The cupcake craze is now years past, I realize, but Raleigh is Raleigh and this is what we have.